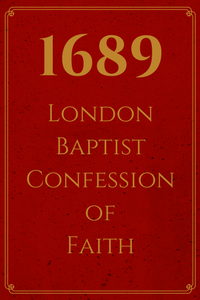 We recognize the London Baptist Confession of 1689 to be an accurate summary statement of what the Scriptures teach. 5.We may be moved and induced by the testimony of the church of God to an high and reverent esteem of the Holy Scriptures; and the heavenliness of the matter, the efficacy of the doctrine, and the majesty of the style, the consent of all the parts, the scope of the whole (which is to give all glory to God), the full discovery it makes of the only way of man's salvation, and many other incomparable excellencies, and entire perfections thereof, are arguments whereby it doth abundantly evidence itself to be the Word of God; yet notwithstanding, our full persuasion and assurance of the infallible truth, and divine authority thereof, is from the inward work of the Holy Spirit bearing witness by and with the Word in our hearts. 6.The whole counsel of God concerning all things necessary for his own glory, man's salvation, faith and life, is either expressly set down or necessarily contained in the Holy Scripture: unto which nothing at any time is to be added, whether by new revelation of the Spirit, or traditions of men. Nevertheless, we acknowledge the inward illumination of the Spirit of God to be necessary for the saving understanding of such things as are revealed in the Word, and that there are some circumstances concerning the worship of God, and government of the church, common to human actions and societies, which are to be ordered by the light of nature and Christian prudence, according to the general rules of the Word, which are always to be observed. 3. They being the root, and by God's appointment, standing in the room and stead of all mankind, the guilt of the sin was imputed, and corrupted nature conveyed, to all their posterity descending from them by ordinary generation, being now conceived in sin, and by nature children of wrath, the servants of sin, the subjects of death, and all other miseries, spiritual, temporal, and eternal, unless the Lord Jesus set them free. 1. The distance between God and the creature is so great, that although reasonable creatures do owe obedience to him as their creator, yet they could never have attained the reward of life but by some voluntary condescension on God's part, which he hath been pleased to express by way of covenant. 2. The Son of God, the second person in the Holy Trinity, being very and eternal God, the brightness of the Father's glory, of one substance and equal with him who made the world, who upholdeth and governeth all things he hath made, did, when the fullness of time was come, take upon him man's nature, with all the essential properties and common infirmities thereof, yet without sin; being conceived by the Holy Spirit in the womb of the Virgin Mary, the Holy Spirit coming down upon her: and the power of the Most High overshadowing her; and so was made of a woman of the tribe of Judah, of the seed of Abraham and David according to the Scriptures; so that two whole, perfect, and distinct natures were inseparably joined together in one person, without conversion, composition, or confusion; which person is very God and very man, yet one Christ, the only mediator between God and man. 6. Although the price of redemption was not actually paid by Christ till after his incarnation, yet the virtue, efficacy, and benefit thereof were communicated to the elect in all ages, successively from the beginning of the world, in and by those promises, types, and sacrifices wherein he was revealed, and signified to be the seed which should bruise the serpent's head; and the Lamb slain from the foundation of the world, being the same yesterday, and to-day and for ever. 2. This effectual call is of God's free and special grace alone, not from anything at all foreseen in man, nor from any power or agency in the creature, being wholly passive therein, being dead in sins and trespasses, until being quickened and renewed by the Holy Spirit; he is thereby enabled to answer this call, and to embrace the grace offered and conveyed in it, and that by no less power than that which raised up Christ from the dead. 1. Those whom God effectually calleth, he also freely justifieth, not by infusing righteousness into them, but by pardoning their sins, and by accounting and accepting their persons as righteous; not for anything wrought in them, or done by them, but for Christ's sake alone; not by imputing faith itself, the act of believing, or any other evangelical obedience to them, as their righteousness; but by imputing Christ's active obedience unto the whole law, and passive obedience in his death for their whole and sole righteousness by faith, which faith they have not of themselves; it is the gift of God. 3. Christ, by his obedience and death, did fully discharge the debt of all those that are justified; and did, by the sacrifice of himself in the blood of his cross, undergoing in their stead the penalty due unto them, make a proper, real, and full satisfaction to God's justice in their behalf; yet, inasmuch as he was given by the Father for them, and his obedience and satisfaction accepted in their stead, and both freely, not for anything in them, their justification is only of free grace, that both the exact justice and rich grace of God might be glorified in the justification of sinners. 5. God doth continue to forgive the sins of those that are justified, and although they can never fall from the state of justification, yet they may, by their sins, fall under God's fatherly displeasure; and in that condition they have not usually the light of his countenance restored unto them, until they humble themselves, confess their sins, beg pardon, and renew their faith and repentance. 1. They who are united to Christ, effectually called, and regenerated, having a new heart and a new spirit created in them through the virtue of Christ's death and resurrection, are also farther sanctified, really and personally, through the same virtue, by His Word and Spirit dwelling in them; the dominion of the whole body of sin is destroyed, and the several lusts thereof are more and more weakened and mortified, and they more and more quickened and strengthened in all saving graces, to the practice of all true holiness, without which no man shall see the Lord. 1. The grace of faith, whereby the elect are enabled to believe to the saving of their souls, is the work of the Spirit of Christ in their hearts, and is ordinarily wrought by the ministry of the Word; by which also, and by the administration of baptism and the Lord's supper, prayer, and other means appointed of God, it is increased and strengthened. 4. As repentance is to be continued through the whole course of our lives, upon the account of the body of death, and the motions thereof, so it is every man's duty to repent of his particular known sins particularly. 2. These good works, done in obedience to God's commandments, are the fruits and evidences of a true and lively faith; and by them believers manifest their thankfulness, strengthen their assurance, edify their brethren, adorn the profession of the gospel, stop the mouths of the adversaries, and glorify God, whose workmanship they are, created in Christ Jesus thereunto, that having their fruit unto holiness they may have the end eternal life. 5. We cannot by our best works merit pardon of sin or eternal life at the hand of God, by reason of the great disproportion that is between them and the glory to come, and the infinite distance that is between us and God, whom by them we can neither profit nor satisfy for the debt of our former sins; but when we have done all we can, we have done but our duty, and are unprofitable servants; and because as they are good they proceed from his Spirit, and as they are wrought by us they are defiled and mixed with so much weakness and imperfection, that they cannot endure the severity of God's punishment. 6. Yet notwithstanding the persons of believers being accepted through Christ, their good works also are accepted in him; not as though they were in this life wholly unblameable and unreprovable in God's sight, but that he, looking upon them in his Son, is pleased to accept and reward that which is sincere, although accompanied with many weaknesses and imperfections. 3. And though they may, through the temptation of Satan and of the world, the prevalency of corruption remaining in them, and the neglect of means of their preservation, fall into grievous sins, and for a time continue therein, whereby they incur God's displeasure and grieve his Holy Spirit, come to have their graces and comforts impaired, have their hearts hardened, and their consciences wounded, hurt and scandalize others, and bring temporal judgments upon themselves, yet shall they renew their repentance and be preserved through faith in Christ Jesus to the end. 4. True believers may have the assurance of their salvation divers ways shaken, diminished, and intermitted; as by negligence in preserving of it, by falling into some special sin which woundeth the conscience and grieveth the Spirit; by some sudden or vehement temptation, by God's withdrawing the light of his countenance, and suffering even such as fear him to walk in darkness and to have no light, yet are they never destitute of the seed of God and life of faith, that love of Christ and the brethren, that sincerity of heart and conscience of duty out of which, by the operation of the Spirit, this assurance may in due time be revived, and by the which, in the meantime, they are preserved from utter despair. 6. Although true believers be not under the law as a covenant of works, to be thereby justified or condemned, yet it is of great use to them as well as to others, in that as a rule of life, informing them of the will of God and their duty, it directs and binds them to walk accordingly; discovering also the sinful pollutions of their natures, hearts, and lives, so as examining themselves thereby, they may come to further conviction of, humiliation for, and hatred against, sin; together with a clearer sight of the need they have of Christ and the perfection of his obedience; it is likewise of use to the regenerate to restrain their corruptions, in that it forbids sin; and the threatenings of it serve to shew what even their sins deserve, and what afflictions in this life they may expect for them, although freed from the curse and unallayed rigour thereof. The promises of it likewise shew them God's approbation of obedience, and what blessings they may expect upon the performance thereof, though not as due to them by the law as a covenant of works; so as man's doing good and refraining from evil, because the law encourageth to the one and deterreth from the other, is no evidence of his being under the law and not under grace. 3. The revelation of the gospel unto sinners, made in divers times and by sundry parts, with the addition of promises and precepts for the obedience required therein, as to the nations and persons to whom it is granted, is merely of the sovereign will and good pleasure of God; not being annexed by virtue of any promise to the due improvement of men's natural abilities, by virtue of common light received without it, which none ever did make, or can do so; and therefore in all ages, the preaching of the gospel has been granted unto persons and nations, as to the extent or straitening of it, in great variety, according to the counsel of the will of God. 5. The reading of the Scriptures, preaching, and hearing the Word of God, teaching and admonishing one another in psalms, hymns, and spiritual songs, singing with grace in our hearts to the Lord; as also the administration of baptism, and the Lord's supper, are all parts of religious worship of God, to be performed in obedience to him, with understanding, faith, reverence, and godly fear; moreover, solemn humiliation, with fastings, and thanksgivings, upon special occasions, ought to be used in an holy and religious manner. 7. As it is the law of nature, that in general a proportion of time, by God's appointment, be set apart for the worship of God, so by his Word, in a positive moral, and perpetual commandment, binding all men, in all ages, he hath particularly appointed one day in seven for a sabbath to be kept holy unto him, which from the beginning of the world to the resurrection of Christ was the last day of the week, and from the resurrection of Christ was changed into the first day of the week, which is called the Lord's day: and is to be continued to the end of the world as the Christian Sabbath, the observation of the last day of the week being abolished. 1. Baptism and the Lord's Supper are ordinances of positive and sovereign institution, appointed by the Lord Jesus, the only lawgiver, to be continued in his church to the end of the world. 2. In this ordinance Christ is not offered up to his Father, nor any real sacrifice made at all for remission of sin of the quick or dead, but only a memorial of that one offering up of himself by himself upon the cross, once for all; and a spiritual oblation of all possible praise unto God for the same. So that the popish sacrifice of the mass, as they call it, is most abominable, injurious to Christ's own sacrifice the alone propitiation for all the sins of the elect. 6. That doctrine which maintains a change of the substance of bread and wine, into the substance of Christ's body and blood, commonly called transubstantiation, by consecration of a priest, or by any other way, is repugnant not to Scripture alone, but even to common sense and reason, overthroweth the nature of the ordinance, and hath been, and is, the cause of manifold superstitions, yea, of gross idolatries. 8. All ignorant and ungodly persons, as they are unfit to enjoy communion with Christ, so are they unworthy of the Lord's table, and cannot, without great sin against him, while they remain such, partake of these holy mysteries, or be admitted thereunto; yea, whosoever shall receive unworthily, are guilty of the body and blood of the Lord, eating and drinking judgment to themselves. 2. The end of God's appointing this day, is for the manifestation of the glory of his mercy, in the eternal salvation of the elect; and of his justice, in the eternal damnation of the reprobate, who are wicked and disobedient; for then shall the righteous go into everlasting life, and receive that fulness of joy and glory with everlasting rewards, in the presence of the Lord; but the wicked, who know not God, and obey not the gospel of Jesus Christ, shall be cast aside into everlasting torments, and punished with everlasting destruction, from the presence of the Lord, and from the glory of his power.